Professional movers in Montclair, Virginia are only a phone call away. Our full-service moving company is on standby for all of your moving, packing, and storing needs. With over three decades of experience, we can relocate you and your belongings anywhere you desire at an affordable price. Whether it’s across state lines, or even out of the country, Able Moving & Storage can help provide a stress-free experience. The best Montclair movers are always within reach when you have Able’s number. Call us today to request a free estimate for your next move or if you have any questions about our process. One of our dedicated 200+ employees will answer your call and your questions! Without hesitation or reservation I can and will recommend and refer them every opportunity I get. Able Moving & Storage has been helping the families of Montclair relocate their personal items all over the country. Our residential moving team will make the process straightforward and simple and best of all, you won’t have to lift anything! Let us handle the hard work of your move; we’ve been doing this for 30 years. If you’re leaving Montclair and need help moving your belongings outside of the local region, Able can assist you. When using our moving company, you’re getting 30 years of experience to help complete your long distance relocation with ease. We make interstate moving easy, every truck is inspected before being loaded. Once loaded, your items will be inspected and labeled to make unloaded even easier. By using this approach, we’re able to deliver the best long distance moving service in Montclair, Virginia. If you ever question if we’re the company to help you relocate, just read our reviews! Secure storage for Montclair is right around the corner! Contact Able if you have any questions about the storage experience you’ll receive with one of our three warehouses! The cost of your move depends on a few different factors. First, one our estimators will visit the starting location of your move. Once on site, he or she will determine how many movers are needed, and how many hours it will take. Other costs, such as travel fees, will be included as well. 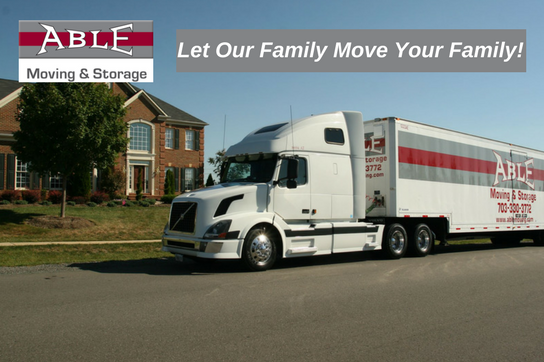 Our moving quotes are flexible so if you’re moving on a budget, speak with us to see what our family can do for your family! ​Our Montclair moving costs are competitive and fair. Here at Able, we’ve earned a reputation we’re proud of. Customers have described our services as affordable and reliable. If you’re moving, you’re packing. Whether you need a residential or commercial relocation isn’t an issue for Able Moving & Storage, we handle all types of moves. What we’re interested in knowing is whether you prefer help packing your belongings or prefer to do this yourself. We are a full-service moving company that offers everything from moving your boxes, to helping pack them. Additionally, we also offer quality packing supplies if you’re more of the ‘DIY’ type. We offer moving boxes too, if you need anything for your upcoming home or office move, Able has it! Give us a call today if you have any specific questions about our packing service or supplies. There are many Montclair movers to choose from when you need to move in the area. Our moving service was designed with you in mind. It’s our goal to make the moving process as hands off for you as possible. Over the last 30 years, we’ve done exactly that. Hiring Able Moving & Storage for your moving, packing, and storage needs is the most obvious choice for customers who value customer service, quality of work, and fair pricing.